enjoying and promoting the use of these plants in the garden. enjoying and evaluating eriogonums in the wild. assembling, developing and sharing information on the propagation, cultivation, identification and distribution of the eriogonum species. providing a seed exchange to distribute eriogonum species seed for use in gardens. protecting rare and endangered species of eriogonums. advancing the overall understanding of eriogonum from a scientific perspective. To meet these objectives have a website devoted to the society, an on-line newsletter published four to six times per year, annual trips including educational opportunities to view and learn more about eriogonums, access to an annual seed exchange, and in the future shall have an annual bulletin with articles of interest and nice photographs. 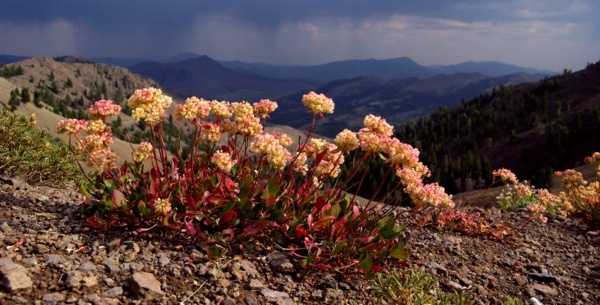 The website includes sections of member collected and published information on propagation, cultivation, identification and distribution of the various species of eriogonum including good photos of as many species as we can photograph. In addition the website will provide information on society trips, members news, seed exchange, and other items of interest. We had our inaugual meeting in Reno, Nevada, June 10-13, 2010 and yearly in other venues thereafter. Those who attended these meetings can testify that they were spectacular; you will not want to miss the next meeting based in Claremont, CA and the Rancho Santa Ana Botanic Gardens June 14-18, 2018. In addition to having access to all the above items as a member, we will all have the opportunity to share friendship, experiences and botanize with others who have similar interests. Society dues for membership are $10/annually, renewed each January.